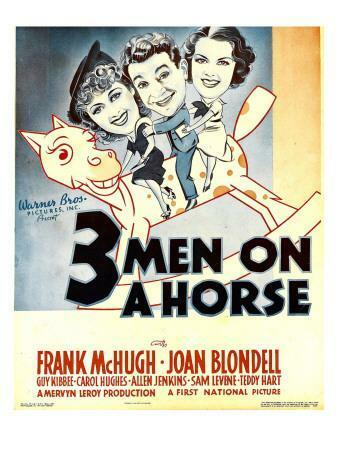 Frank McHugh got a rare starring role in the comedy THREE MEN ON A HORSE, based on the hit Broadway play by George Abbott and John Cecil Holmes. McHugh was usually cast as the funny friend of fellow members of “Hollywood’s Irish Mafia “ James Cagney and Pat O’Brien, but here he takes center stage as a meek, hen-pecked type who has an uncanny knack for picking winning horses – as long as he doesn’t bet on them! Greeting card writer Erwin Trowbridge is beset by a whiney wife, obnoxious brother-in-law, and bullying boss. After a row with wifey brought on by meddling bro-in-law, Erwin leaves his humble Ozone Park, Queens abode and decides to skip work and get sloshed. Stumbling into a seedy hotel bar frequented by Runyonesque gamblers, Erwin gives them a winning pony – then passes out. The three mugs, Patsy, Charlie, and Frankie, bring him up to Patsy’s room to recuperate, hoping the little genius will bring them good luck, not to mention winners. Patsy, who thinks Erwin’s greeting card verses are sheer poetry, calls boss Carver to demand a raise for the schlep, which results in Erwin’s firing. The gamblers head to the track, but when Patsy returns, he catches Erwin with his dame Mabel in a compromising position. It was all a mistake, but Erwin’s winning well has run dry… seems he can’t pick horses unless he’s riding on the Ozone Park bus! Needless to say, Patsy and the boys accommodate him, leading to further complications with wife Audrey, in-law Clarence, and mean Mr. Carver…. THREE MEN ON A HORSE does suffer from staginess, which is surprising since the director is Mervyn LeRoy , famous for “moving” pictures like LITTLE CAESAR, I AM A FUGITIVE FROM A CHAIN GANG, and QUO VADIS, among others. The exaggerated “New Yawk” accents the actors use (‘Oy-win’ for Erwin, for example) gets a bit annoying at times, as does Carol Hughes’ whiney portrayal of whiney Audrey. 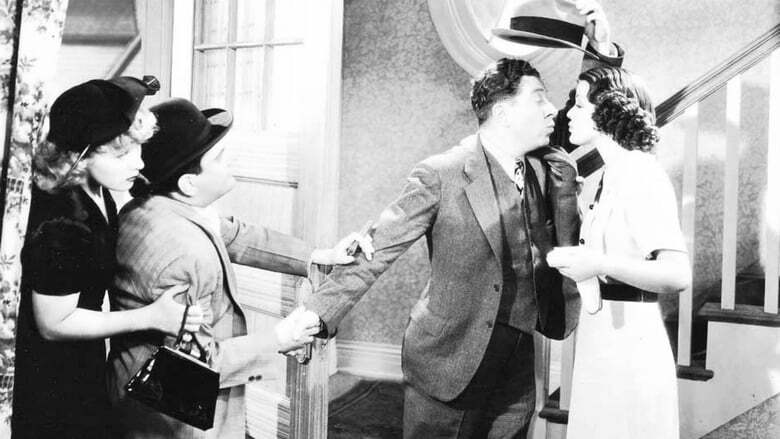 The saving grace is a marvelous cast of character actors, all of whom get a chance to shine. McHugh is great as the spineless Oy-win, I mean Erwin, who finally gets to assert himself at the end. He’s especially good during his drunk scenes… not a stretch for one of “Hollywood’s Irish Mafia”! Joan Blondell , playing Patsy’s “goil” Mabel, is a welcome sight in any movie. Patsy himself is Sam Levene , making his film debut in the role he originated on Broadway. His cohorts are Allen Jenkins (sarcastic Charlie) and Teddy Hart (Frankie), an actor I know little about except he played Crowbar in a few ‘Ma & Pa Kettle’ epics. 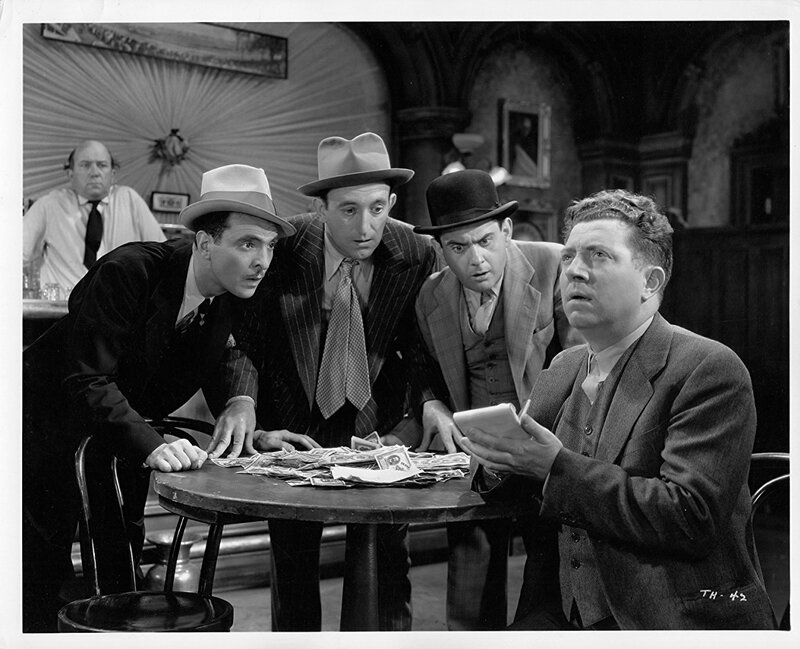 Old reliable Guy Kibbee is boss Carver, Eddie ‘Rochester’ Anderson gets in on the fun as an elevator operator who plays the ponies, and that “Master of the Slow Burn” Edgar Kennedy gets some good laughs as Harry the bartender. It’s a minor movie, to be sure, but one that on the whole is enjoyable. It gives McHugh and company a chance to break free of their usual secondary parts and have some fun. Despite a couple of quibbles, THREE MEN ON A HORSE is a comedy “woith” watching! Haha! Well, if you say this film is “woith” watching, I will track it down. Sounds like a terrific premise. It’s a lot of fun to see second-stringers like McHugh and Levene get the spotlight. Plus, you get Joan Blondell, Edgar Kennedy, and Rochester! Can’t beat that!